“The seventh Pay Commission is in the form of recommendations. I do not think they (recommendations) will remain. I do not consider them as finalities. I have flagged them and will flag them properly at the right level,” said the defence minister. 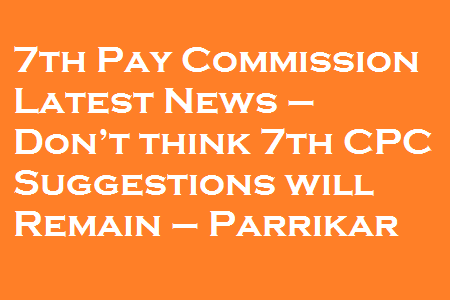 7th Pay Commission Latest News – Don’t think 7th CPC Suggestions will Remain – “I will not claim that I have turned it around completely but at least something has been done so that deliveries can start. Ground has been prepared. Delivery is now the key word,” said Parrikar. Defence Minister Manohar Parrikar on Tuesday said the recommendation of 7th Pay Commission was not final and he would take up concerns raised by the Armed Forces at the right level. In an exclusive interview with the India Today, Parrikar said he has prepared ground for smoothening the defence procurement which needed to be backed by deliveries now. On the concerns raised by the Armed Forces over the raw deal given to them in the 7th Pay Commission, Parrikar said it was not the final word. 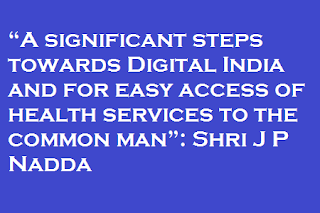 “The seventh Pay Commission is in the form of recommendations. I do not think they (recommendations) will remain. I do not consider them as finalities. I have flagged them and will flag them properly at the right level,” said the defence minister. Parrikar, who inaugurated arms show DefExpo in Goa on Monday where a strong pitch is being made to further expand the growing defence sector, said negative environment surrounding the military acquisitions has changed. “I will not claim that I have turned it around completely but at least something has been done so that deliveries can start. Ground has been prepared. Delivery is now the key word,” said Parrikar adding that there was an environment of mistrust, suspicion which can be frustrating in dealing with forces. He said the industry cannot be held responsible for responding slowly to the changing atmosphere. “They have experienced a congested atmosphere and the breeze has only now begun flowing in. However, it cannot happen overnight. Confidence building measures are in place. Industry has begun responding,” he said outlining how smaller changes have been made. “Offsets have taken off, exports are improving, procurement from local level has gone up. At the capital procurement level, it has not taken off or turned into a big deal because it takes longer. Industry has definitely responded.” Talking about the defence reforms like the appointment of a Chief of Defence Staff, Parrikar said there are no hurdles in bringing defence reforms. “There has to be a rational decision. Drafts are being prepared and shared. Very soon it will be brought to the Cabinet,” he said. Asked about delay in development of critical equipment like Intermediate Jet Trainers (IJT) for the IAF or submarines for the navy, Parrikar said the air force does not think the IJT is a requirement as it is training on simulators, Basic Trainer Aircraft and Advanced Jet Trainer. “Instead of three, it is a two-level, re-caliberated approach. The proposal for six under-construction Scorpene submarines is moving smoothly. Next project P75, I will tag along with our policy document on Strategic Partnership,” Parrikar said. “When it will come about? Very soon, but I am not willing to issue a timeline. As far as Arihant, the issue should not be discussed. We are equally concerned and are moving in the right direction,” he said. The three services raised a number of issues, but when the pay commission sought the defence ministry’s comments and recommendation, the ministry negated most of the demands of the services, the officer said. Payment of honorarium for training on projects developed by the department. 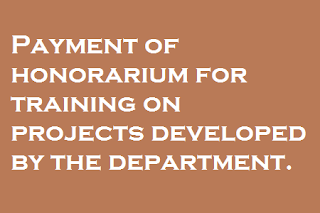 Subject:- Payment of honorarium for training on projects developed by the department. Reference: HQ Circular No. 06 dated 10.01.2013. 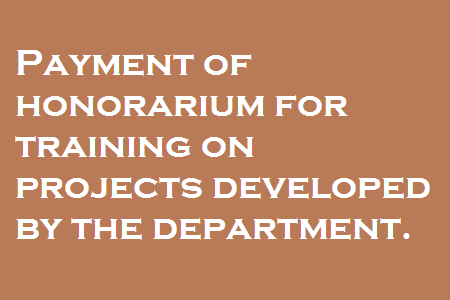 The instructions issued vide circular mentioned above on payment of honorarium for training on projects developed in the department have been reviewed. 2. Keeping in view the extra efforts made by the faculty in delivering training on such projects and to ensure effectiveness of training, the Competent Authority has agreed to allow payment of honorarium to officers who impart training on projects developed by the department as per the Government rules. 3. Further, it is suggested that the resource material developed for such training programmes should be retained by the respective training establishments as a resource bank of training material. The 6th Central Pay Commission suggested elaborate changes in the method of calculating Dearness Allowance. 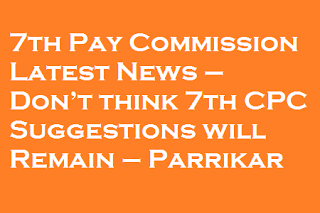 This time however, the 7th Central Pay Commission did not suggest any elaborate changes. It has suggested that the same process be continued. We have presented an easy-to-use calculator here for you to calculate the likely Dearness Allowance hike. We have presented a ready reckoner of the procedures that were followed when the 5th Central Pay Commission drew to a close and the 6th Central Pay Commission came into effect, which are very likely to be followed this time too. 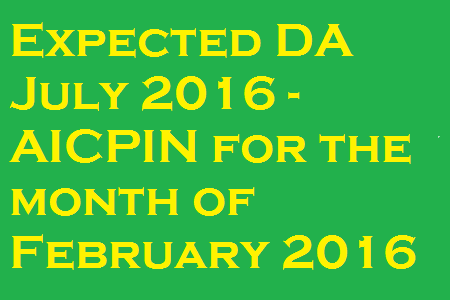 The AICPIN points of only the month of January are available as of now. 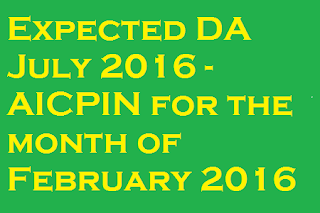 The AICPIN points for February will be released tomorrow. You can come up with approximate AICPIN points for the remaining four months to calculate the approximate Dearness Allowance. As of January 1, 2016, according to the Centre, the Dearness Allowance stood at 125 percent. An order of the Ministry of Finance to this effect will be released soon. In the event that the 7th Central Pay Commission recommendations come into effect from January 1, 2016 onwards, the salaries of the Central Government employees will be revised by adding 125 percent to their basic pay. 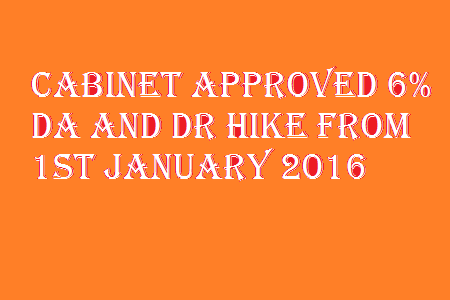 The new Dearness Allowance hike will be issued from 01.07.2016 onwards. For example, if the basic pay of an employee, as on 01.01.2016, is Rs.12,000 (Grade Pay 2800 + 9200), his salary revisions and Dearness Allowance hikes as per the 6th and 7th Central Pay Commission recommendations, are given below. 1. 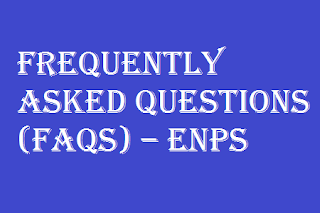 What is eNPS ? eNPS is an online platform provided by NPS Trust for enabling individuals to open his/her Individual Pension Account under NPS (Tier-I & Tier-II) and also facilitate the new or existing subscribers to make initial or subsequent contributions respectively to their Individual Pension Account under NPS using netbanking and debit/credit cards. 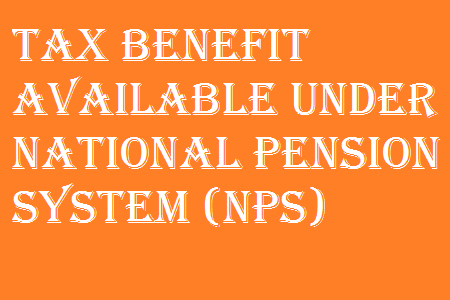 eNPS does not facilitate enrolment of individuals under Atal Pension Yojana. 2. How can I open the Individual Pension Account under NPS online? 3. How Aadhaar details are processed for online opening of the Individual Pension Account under NPS? An individual opting to open the online Individual Pension Account using Aadhaar details must have his/her mobile number registered with Aadhaar because after providing the Aadhaar number in the eNPS portal, a One Time Password (OTP) needs to be generated from Aadhaar which is sent to his/her mobile number registered with Aadhaar for authentication purposes. On authenticating the OTP received from Aadhaar in the eNPS portal, the individual’s KYC details (demographic and photograph) as recorded with Aadhaar database gets auto populated on the online application form. Only the photograph is allowed to be replaced/substituted in the online application form if he/she desires to upload a different photograph. 4. How PAN details and KYC details as recorded with his/her Bank are processed for online opening of the Individual Pension Account under NPS? An individual opting to open the online Individual Pension Account using PAN details and KYC details as recorded with his/her Bank must have enabled net banking facility from the bank where his/her account is held/maintained and the concerned Bank selected should also be empaneled on the eNPS platform for performing the KYC verification. The name provided in the online application form is validated with the PAN records. The bank and address details provided in the online application form is authenticated by the concerned bank selected by the applicant as per the records available with the Bank in respect of the applicant. In case of rejection of KYC by the selected Bank, applicant should contact the bank as the PRAN will be get immediately categorised as ‘temporarily frozen’ and the subscriber will not be allowed to undertake any further transactions. 5. What uploads are required to be made for online opening of the Individual Pension Account under NPS? 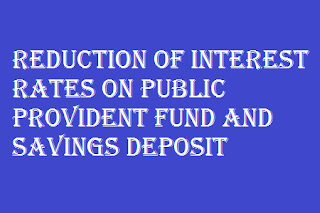 An individual opening the Individual Pension Account in eNPS platform is required to upload his/her scanned photograph and signature in *.jpeg/* .jpg format with file size ranging between 4kb-12kb. Uploading of scanned photograph is optional for individuals opting to open the Individual Pension Account with Aadhaar details. 6. At what stage of the online process will I be able to know that my online application has been accepted and I have been allotted a Permanent Retirement Account Number? An applicant on completion of providing online his/her personal details as selected with Aadhar or PAN and subsequently getting authenticated from Aadhaar or PAN will be provided with an unique Acknowledgement Number for identification and future references. After the applicant fills in all the mandatory fields of the online application form and uploads his/her photograph (optional with Aadhaar) and signature, the applicant will be redirected for initiating payment of initial contribution through netbanking or debit/credit card. An applicant who has opted to open his/her Individual Pension Account with Aadhaar will have the option to select the mode of payment (netbanking or debit card or credit card) for making the initial contribution. An applicant who has opted to open the Individual Pension Account with PAN and KYC authentication by Bank will be required to make the payment of initial contribution though netbanking facility provided by the concerned bank selected in the online application form. For all successful online payments the applicant will be provided an online receipt and the Permanent Retirement Account Number (PRAN) generated thereafter. An SMS and email alert is also sent to the Subscriber. 7. How will I know whether my Banker has verified the KYC details? On acceptance or rejection of applicant’s KYC by the selected Bank an SMS and email alert is sent to the Subscriber towards acceptance or rejection. In cases of rejection by the concerned Bank, the reasons of rejections are also communicated to the subscriber through SMS and email and the applicant should contact the bank immediately. The online opening of Individual Pension Account with Aadhaar details is free of any charges. An applicant opting for online opening of Individual Pension Account with PAN and KYC authentication by Bank will be charged an amount of Rs 125 (Rupees One Hundred Twenty Five Only) for KYC verification by the concerned bank selected by the applicant during the online account opening process. 9. What are the charges to be paid for making online contributions? 1 Credit Card 0.90% of Transaction Amount + Service Tax. 2 Debit Card 0.80% of Transaction Amount + Service Tax. 3 Net Banking of Banks 60 Paisa per Transaction + Service Tax. 10. What should I do after completing the online account opening processes? 11. What will happen if I do not submit the documents within 90 days from the date on online PRAN allotment? Non-submission of printed online application form along with photograph and signature within 90 days of allotment of online PRAN will render the PRAN to be categorised as `temporarily frozen’ and he/she will not be able to undertake any further transactions. 12. What is the minimum amount of contribution to be made for online opening of the Individual Pension Account under NPS? The minimum amount of contribution to be made using netbanking or debit/credit card for online opening of the Individual Pension Account is Rs 500/- (Rupees Five Hundred Only). If applicant chooses to open Tier-II along with Tier-1 The minimum amount of contribution is Rs 1000/- (Rupees One Thousand Only). 13. 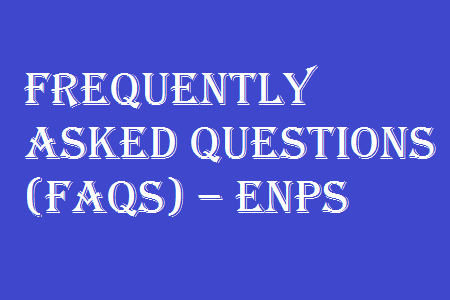 What is the maximum amount or times that I can contribute to my PRAN in a month using eNPS? There are no limits or restrictions for making contributions by subscribers to his/her PRAN using the eNPS platform. 14. Where and when will I receive the PRAN kit? An individual completing the online account opening process and submitting the online printed application form along with photograph and signature will receive the PRAN kit at his/her communication address provided during the online registration process within 10 days from the date of receipt of completed documents at CRA. 15. When will the contribution paid online get reflected in my PRAN? It normally takes 3-4 days for the contributions made online using eNPS being reflected in his/her PRAN. 16. Can I make changes in the application and in PRAN details online? 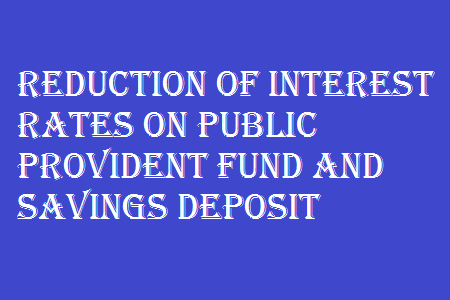 Subscribers desirous of changing/revising the detai Is provided i n the online application form will be able to amend the details online until the stage of initiating online payment towards initial contribution for PRAN generation is completed. After allotment of online PRAN, subscriber desirous of changing/revising the PRAN details has to contact a registered Point of Presence and comply with the existing procedures of filling up the relevant forms and submitting the with relevant documents mentioned therein. 17. How can I make subsequent contributions to my PRAN? All subscribers (excluding NPS Lite & Atal Pension Yojana) irrespective of their PRAN being generated through online (eNPS) or physical mode (PoP) can contribute to their PRAN (Tier I & Tier II) using eNPS platform through netbanking of empanelled banks or through credit / debit cards. Subscribers are required to quote the correct PRAN and authenticate it using the OTP received by the subscriber in his/her registered mobile while initiating the payment for contribution towards his/her PRAN. 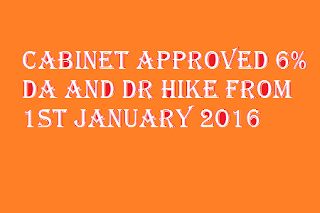 Attention is invited to this Department’s Office Memorandum of even number dated 27th January, 2016 vide which it was conveyed that the Union Public Service Commission had brought to the notice of this Department that Ministries/Departments are not notifying the recruitment rules to a number of posts which were advised upon by the Commission even after the lapse of ten weeks time. 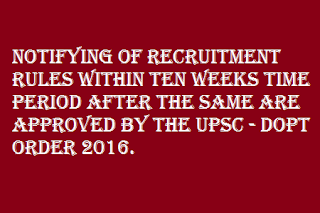 Ministries/Departments were, accordingly, requested to take immediate actions to notify the Recruitment Rules as soon as these are approved by the Commission so that the time limit of 10 weeks as prescribed in Para No. 5.2 of this Department’s O.M. No. A.B.14017/48/2010-Estt. (RR) dated 31st December, 2010, is adhered to. DoPT guidelines on framing/amendment/relaxation of Recruitment Rules vide para 3.1.5 dated 31 st December, 2010 provide that the Recruitment Rules should be reviewed once in 5 years with a view to effecting such change as are necessary to bring them in conformity with the changed position, including additions to or reductions in the strength of the lower and higher level posts. Further, consequent upon the implementation of the 6th CPC recommendations, DoPT vide OM dated 24.3.2009 had issued instructions to all the Ministries/Departments to initiate action to amend the existing Service Rules/Recruitment Rules in view of the revised pay structure/merger of pre-revised pay scales/up-gradation etc. These instructions were reiterated vide this Department’s OM. No. AB.14017/61/2008-Estt (RR) dated 25 th March, 2014. 2. 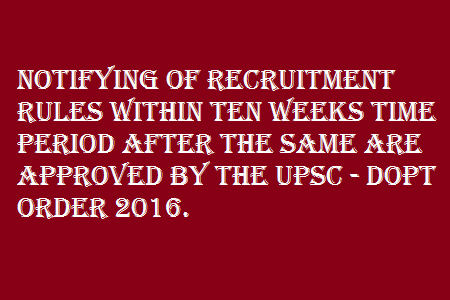 It is understood that many Ministries/Departments have still not updated their Recruitment Rules. Periodic revision of RRs is important to ensure that candidates with requisite qualifications are selected. 3. 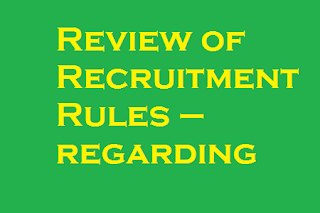 Ministries/Departments are, therefore, requested to undertake revision of Recruitment Rules under their purview and update the Recruitment Rules by 30.9.2016. 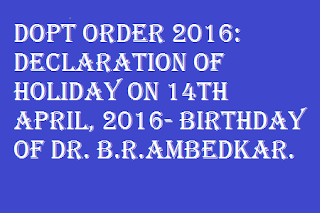 Declaration of Holiday on 14th April, 2016- Birthday of Dr. B.R.Ambedkar. Dated the 21st March, 2016. 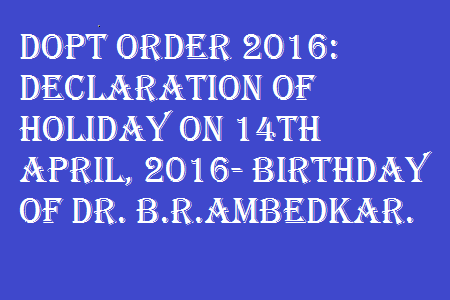 Subject: Declaration of Holiday on 14th April, 2016- Birthday of Dr. B.R.Ambedkar. It has been decided to declare Thursday, the 14th April 2016, as a Closed Holiday on account of the birthday of Dr. B.R. Ambedkar, for all Central Government Offices including Industrial Establishments throughout India. 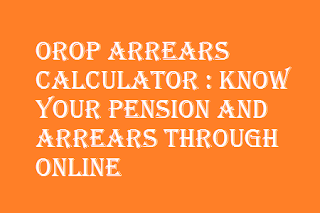 An on line solution to find the correct pension of a Defence pensioner and Family pensioner is a long pending need. Unfortunately, the PDAs and DPDOs have not given much importance to this aspect. 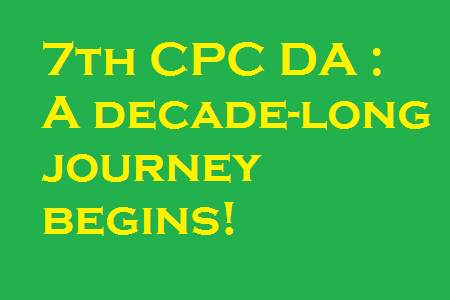 Also frequent changes in the pension regulations, various anomalies arising while implementing the pay commission’s recommendations, rigid attitude of MOD and the lethargic attitude of the CDA(P) and CGDA have all joined together and made the Defence pension pension payment a most complicated job to the Banks. Now the pensions of the entire 2.5 million Defence pensions have to be revised under OROP Scheme. The Banks are struggling to find a solution to this task. None of the Banks have any comprehensive software for revising the pension of such a huge number of people. The ultimate sufferers are the poor pensioners. 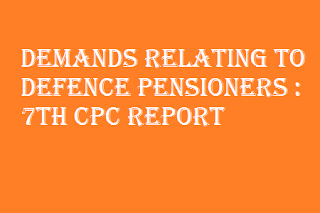 The refinement of Defence pension account is an urgent need. OROP orders were released on 4.2.2016. Till today, none of the banks have bothered to pay the arrears. Nowadays, the banks spent huge amounts for automation. But somehow, they have neglected the Defence pension payment. 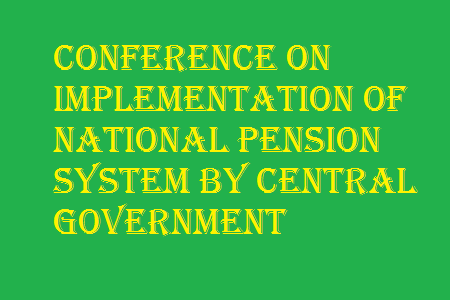 In fact the OROP orders have simplified the entire Defence Pension payment system for fixation of revised pension and opened the gates for developing a comprehensive software for calculation of OROP arrears and fixation of revised pension. Even then, the banks are delaying payment. 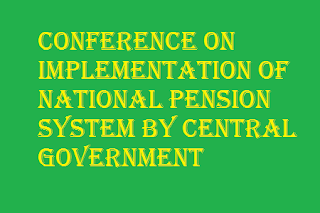 The Table No.7 is the basis for creating all other types of pensions for JCOs and Ors. The various Groups have been reduced to only Two Groups now. Therefore, it is easy for the banks to develop a software only for OROP arrears and revised pension. Unfortunately the banks have not given importance to this aspect. Moreover, the most important parameters required for fixing the new pension is the Rank, Qualifying Service, Group and Date of birth. The banks can pay immediately for whom the above information is available. For others, they can get it from the PSAs on urgent basis. But, it seems that none of the above work is undertaken by any of the banks. 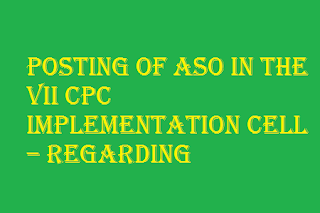 In view of the above, we thought of developing a simple software to calculate the arrears online and forward the working sheet directly to all the CPPCs of the respective banks by email so as to enable them to take up the payment without any further delay. 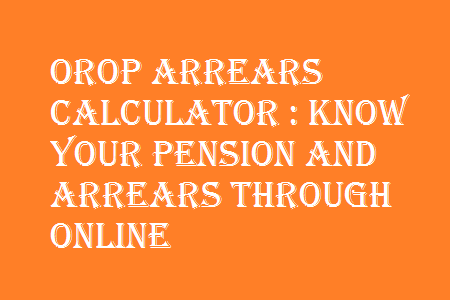 Now click only the OROP arrears for pensioners and filled up all the details. Do not try “Defence Pension” Tab and “Family Pension Arrears Tab” for the time being. At the end you will get Print PDF button. Click and take a print out if you want, and save it in your computer. Now come back to the original blog, click the link for getting email ids of all the banks. Search your bank’s CPPCs email address and forward the OROP arrears print out as an attachment to your bank. This is our humble effort to make the banks to take up the payment at an early date. All the readers of this Blog, please forward and give us feedback. We welcome your comments on our efforts. Officers OROP arrears are not covered under this system. A separate software is being developed for Officers. We will inform as soon as it is ready. The Commission has received a number of demands relating to pensions for defence forces personnel through the Joint Services Memorandum (JSM) from the Services, Pensioners Associations and Bodies including those dealing with the needs of special categories like war veterans, disability etc. 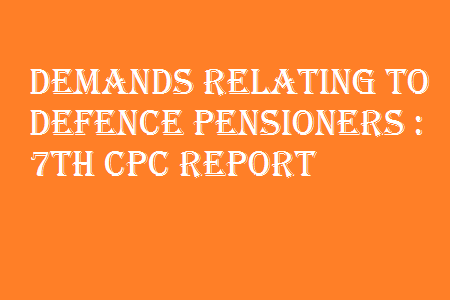 The demands/representations received in the Commission have been examined under the broad categories of Retiring Pension, Family Pension, Disability Pension and Ex-gratia lump sum compensation. i. 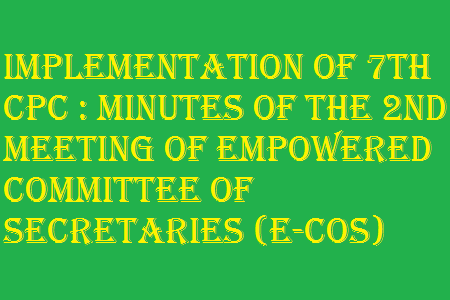 Minimum pension should be fixed at 75 percent of reckonable emoluments for JCOs/ Other Ranks or a compulsory early retirement compensation package or lump sum amount. ii. Additional quantum of pension with advancing age should commence at the age of 70 years for JCOs/ Other Ranks instead of 80 years as prevails today. iii. Pre 2006 Honorary Naib Subedar may be given pension of Naib Subedar. v. The depression in pension for qualifying service between 15 and 20 years may be removed and complete earned pension may be made admissible to Territorial Army personnel. Minimum Pension for JCOs/ ORs : The Services, in the JSM, have sought enhancement of the Service Pension to 75 percent of last drawn reckonable emoluments for JCOs and ORs. In case enhancement of pension to 75 percent of last drawn reckonable emoluments is not granted for JCOs/OR, the Services have sought a compulsory early retirement compensation package or compulsory lateral absorption in government or PSU as an alternative. Analysis and Recommendations: Service pension for all categories of employees has been fixed at 50 percent of the last pay drawn. The recommendations in relation to pay of both the civilian and defence forces personnel will lead to a significant increase in the pay drawn and therefore in the ‘last pay drawn’/‘reckonable emoluments.’ It is also to be noted that in the case of defence forces personnel, in particular all JCOs/ORs, the last pay drawn includes the element of Military Service Pay, which is also taken into account while reckoning pension. The Commission has Report of the Seventh CPC 402 Index also recommended an increase in Military Service Pay. The increase in pay and MSP will automatically and significantly raise the level of pension of JCOs/ORs, since pension is related to the last pay drawn/ reckonable emoluments. Therefore the Commission does not recommend any further increase in the rate of pension for JCOs/ORs. Suggestions have been received from time to time for relaxation of upper age-limit for widows. Relaxation of age up to 35 years (up to 40 years for members of Scheduled Castes and Scheduled Tribes) for the widows, divorced and women judicially separated from their husbands who are re-married for employment to Group ‘C’ and erstwhile Group ‘D’ post has been provided vide Department of Personnel & Training’s Office Memorandum No. 15012/13/79-Estt (D) dated 19.01.1980. Similar relaxation is provided for Group ‘A’ and Group ‘B’ posts except where recruitment is made through open competitive Examination vide Department of Personnel & Training’s Office Memorandum No. 15012/1/87-Estt. (D) dated 05.10.1990. 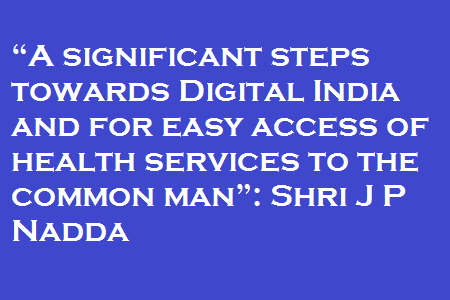 This was stated by the Minister of State for Personnel, Public Grievances and Pensions and Minister of State in the Prime Minister’s Office Dr. Jitendra Singh in written reply to a question by Shri B.Vinod Kumar and Shri Ashwini Kumar in the Lok Sabha today. Dated the 16th March, 2016. 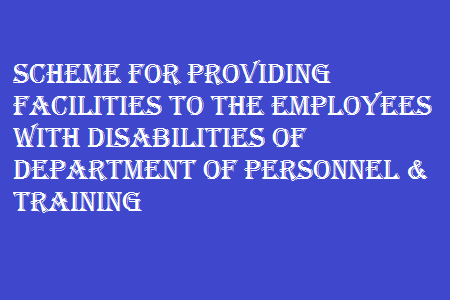 In exercise of powers conferred under Rule 19 of Central Secretariat Service Rules, 2009, the competent authority in this Department hereby orders the inter-cadre transfer of Shri Ashish Sharma, Assistant Section Officer (DR-2011), presently posted in the Ministry of Health and Family Welfare to the Implementation Cell, 7th CPC upto 31.12.2016 or till further order. 2. Ministry of Health and Family Welfare is requested to relieve the concerned officer immediately. DATED, THE 01ST MARCH, 2016. 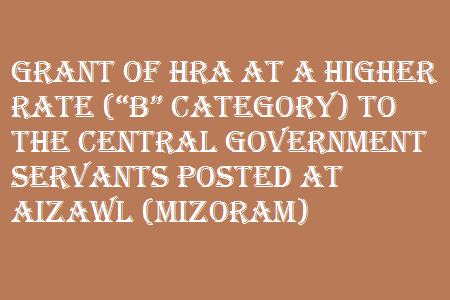 Subject: Grant of HRA at a higher rate (‘B’ Category) to the Central Government Servants Posted at Aizawl (Mizoram) – Court Case regarding. “In view of the position enumerated above,I am of the-view that the applicants are entitled to House Rent Allowance at the rate prescribed for B class cities to the Central Government Employees which should be payable to the applicants at the rate of 15% from 1.1.1986 to 30.9.1986 and from 1.10.86 to 30.9.1986 and from 1.10.86 to 30.9.86 and from 1.10.1986 at flat rate prescribed under O.M.dated 7.8.1987 read with another O.M.dated 13.11.1987 and the Notification GSR No.623 (E) amending the Fundamental Rule 45 A with effect from 1.7.1987. As regards the claim for compensation in lieu of Rent Free Accommodation the respondents are to act in conformity with the Office Memorandum No.12-11/60-ACC-I dated 2.8.1960,O.M.dated 23.2.1986 and 22.5.1987 and also to O.M.dated 13.11.1987. The respondents shall examine the each case on merits and thereafter shall pass necessary order in individual cases. Rent free unfurnished accommodation is admissible to Central Government Employees having all India transfer liability only those who are posted in Mizoram or HRA at the rate prescribed from time to time. 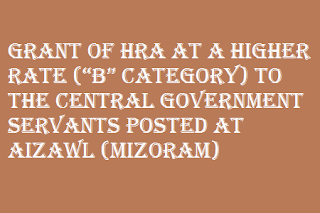 Compensation and admissible HRA shall be granted to those persons who are entitled to rent free accommodation and could not be provided accommodation and the above benefit shall be granted only to the Central Government employees having all India Transfer liability and Posted in Mizoram vide letter No.11015/1/E/(B)/76 dated 31.7.1977. The respondents shall examine the individual cases and thereafter pass necessary orders in those Cases, others will not be eligible for the same.The application is allowed in part, No Costs”. “We have thoughtfully considered the submissions of the learned counsel. In our view, the direction given by the Tribunal, which has been confirmed by the High Court, merely ordains consideration of the cases of each employee for grant of City compensatory Allowance in accordance with O.M. dated 02.08.1960, O.M. dated 23.02.1986 and 2.5.1987 as also O.M.dated 13.11.1987 and nothing more. Therefore, the impugned order as also the one passed by the Tribunal do not call for interference by this court under Article 136 of the Constitution. With the above observation, the appeal is dismissed. 4. 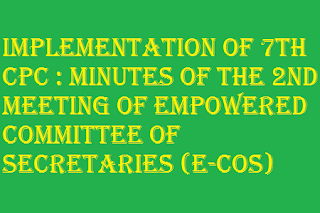 Consequent upon obtaining the concurrence of Integrated Finance Wing of this Department, the, matter was referred to Ministry of Finance, Department of Expenditure for decision. 5. Ministry of Finance, Department of Expenditure has considered the matter and accorded their approval in view of the decision taken by the Department of Posts to not to file any Review petition in the matter and as the Ministry of Law & Justice has advised Department of Posts to take administrative decision for implementation of the said order of Hon’ble Tribunal, implementation of the Order dated 12.04.2002 passed by the Hon’ble CAT, Guwahati Bench in O.A.No.381/2000 for grant of House Rent Allowance at “B/Y” class cities rates, as admissible from time to time, is agreed to. 6. 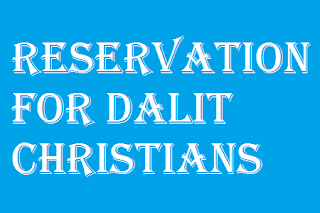 Since, the Department of Posts had represented the Union of India on behalf of all the respondents Ministries/Departments/Offices, the approval accorded by the Department of Expenditure, Ministry of Finance is therefore conveyed to all the Respondent Ministries/Departments/Offices for issuing appropriate instructions for compliance of orders dated 12.04.2002 of Hon’ble CAT, Guwahati Bench in respect of the employees working under their administrative control who were/are applicants in the said OA No.381/2000. 7. This has the approval of the Competent Authority. In accordance with this Department’s O.M. no. 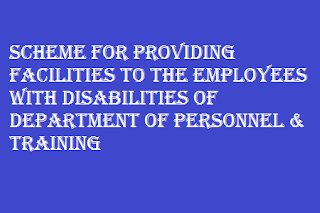 36035/3/2013 – Estt (Res) dated 31.03.2014 a scheme for providing facilities to the Employees with Disabilities in this Department has been formulated.